Single mineral crystals frequently show zoning. This most commonly appears as bands of different colors, but can also be dark, oriented bands within the crystal. There are several causes of these zones in crystals and both their presence and absence can be interesting tools for learning about the mineral and how it grew. Two common types of zoning are concentric zones and sector zones. Concentric zones are familiar to all as in phantom crystals or color zoning in watermelon tourmaline. They are also easy to understand. Crystals grow by adding molecules to their surface in much the same way as trees grow by adding rings to their trunk. If there is a change in the environment in which the crystal is growing, it can lead to different growth bands in the crystal having different colors. This can indicate trace impurities such as iron being added to a growing quartz crystal, which would produce amethyst phantoms in colorless quartz for example. Wholesale changes in chemistry of crystals like tourmaline group minerals leads to more dramatic changes. This type of zoning may also be produced by physical inclusions of rock or other minerals. An example of this would be clay, hematite, or chlorite inclusions coating the surface of an inner layer of crystal growth. Concentric zoning may be more subtle as with garnet and feldspar, for example. Most garnets are zoned; in fact only rarely are they not zoned. But the zoning may not be visually obvious. The most common way in which garnets form is through metamorphism of sedimentary rocks. The core of the garnet, which grows first, will have one chemical composition. As it grows the composition of each layer of the garnet changes as the garnet gets larger. Geologists who analyze garnets using an electron microprobe are able to perform chemical analysis of spots as small as one micron (one thousandth of a millimeter!!). With that technique they are able to make a chemical map of the garnet by analyzing dozens or even hundreds of spots on a single crystal. Commonly these analyses reveal that the garnets (usually amandine) have cores rich in magnesium and rims rich in iron. Some garnets do have visible color bands, but others require microprobe analysis to “see” the zoning. sector zoning due to carbonaceous inclusions. Lastly, there is sector zoning, which can be caused in two ways. Two common examples of this type of zoning are the hourglass sand inclusion in gypsum crystals, and chiastolite (those andalusite crystals with the X-shaped cross sections; Figure 2). 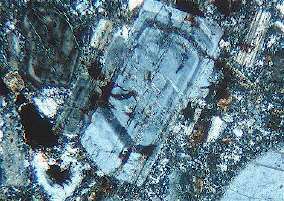 Let’s take gypsum for example to see how these interesting inclusions form. As mentioned, crystals grow by adding atoms to their surfaces. As a gypsum crystal grows calcium, sulfate, and water are attached to the growing gypsum crystal. The crystalline structure forces these raw materials to be added in an organized fashion and they can only be added to certain surfaces and in order. It’s kind of like those child’s toy Leggo blocks. You can only attach blocks to certain sized and shaped blocks. Likewise, a chemical impurity may only fit on a single crystal face as the gypsum grows. This explains why some selenite crystals show sector zoned fluorescence. The element activating fluorescence can only be added to one face and not the other. To help visualize this, try doing this: Draw a small rectangle. Using two different color pens draw another rectangle over the first, making the second one just a tiny bit larger. Use one color for the long side and another for the short side. Repeat this several times, using the same color for the long and short sides of your ever growing rectangle. The result should be a rectangle composed of four different colored triangles. Viola! You have produced a drawing of a sector zoned crystal. A second cause of sector zoned crystals is related to how fast or efficiently different parts of the crystal grow. If a crystal face is growing rapidly, it pushes impurities to the edge of crystal faces. It may also be that the face simply does not allow impurities to be attached to its surface – only to edges. As successive faces are added, the impurity always ends up at the corners of the next crystal layer. Look at your drawing of the rectangle. Connect the corners of each of your rectangles. This produces a cross-shaped pattern resembling the “X” in the cross section of a chiastolite variety of andalusite. English, G.L., 1934, Getting Acquainted with Minerals, McGraw-Hill Book Company, New York, 324 p.
Nesse, W.D., 2000, Introduction to Mineralogy, Oxford University Press, New York, 442 p.
Sinkankas, J., 1964, Mineralogy for Amateurs, Van Nostrand Reinhold Company, New York, 585 p.